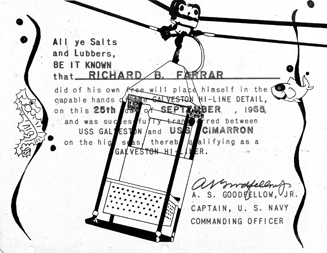 In the fall of 1965, twenty Bendix Mishawaka men were sent overseas to do a retro-fit on the ignition systems on all shipboard Talos missiles in the Pacific and Atlantic. Ten of us went to Vietnam and Japan, five to retro-fit missiles on the USS Galveston CLG-3 which was patrolling right off the Coast of Vietnam near DaNang and five to the USS Oklahoma City CLG-5 which was in port at Yokosuka, near Tokyo in Japan. The other ten of the group went to a port on the coast of Greece and did retro-fits on the US ships there. The retro-fit was to the ignition system which was to ignite the ram jet engine within a second or less after the missile separated from the big solid rocket booster. If this didn't happen promptly, the ram jet thrust was less than drag and Talos would just slow down and fall out of the sky. Our fix was to install a "giant firecracker" that we named the Hot Gas Igniter (HGI) that guaranteed ignition. First of all, all ten of the Bendix team thought, when originally set up, that all ten of us would go to the Galveston and then all ten would go to the Oklahoma City - and that both ships would be operating off the coast of Vietnam. The first thing that came to mind was how we were going to get there and how were we and the equipment going to get on board each ship. These arrangements were being worked out, of course, elsewhere, and we were not involved in that. The first word we got was that we would land by plane on an aircraft carrier and then be transferred by boat to the cruisers. When I heard of landing on a carrier - I said, "I want off the team. Carrier landing is too much of a risk for me and my family." That plan didn't last long - or even it may not have ever been considered. Anyway, most of the ten of us did not really know the details of how we were going to get there and back. We did have two men in the ten who were from Bendix "Field Engineering" and were coordinating with the Navy and were the leaders with respect to travel details for the group. So when the carrier landing was out I was back on the team. However, we did have many plan changes during the trip out and back and that we worked out on the spot. The first stop was at Long Beach/Seal Beach, California, where we did a couple of retro-fits at the depot and checked all our tooling and acquired a lot of extra tooling, spares, etc. and two complete sets of tools and HGI's so that we could operate as two separate teams. We did expect to operate as one team (all ten of us) on one ship at any time. But we wanted to be ready if we operated separately as two teams. So - we had some extra days at Long Beach, California, and we did quite a lot of site-seeing - ball game, Disneyland, surfing, etc. Then it was on to Tokyo via San Francisco and Anchorage - and we met up with a typhoon in Tokyo, spent some time at Yokosuka and at a hotel, site-seeing, etc. Then we got word to split into two teams - that was news to us - the Oklahoma City was in port at Yokosuka and one five man team would stay there, do the retro-fit and then go back to Mishawaka. [The other team went to the USS Galveston off Vietnam] So, that was sort of a major change for us to split up all the equipment and tooling so that each team had the right equipment. Lou DeGrace and I decided to go on to Vietnam and the USS Galveston in September/October 1965, maybe for the adventure. Lou was in my department and he and I were the only two men from the Talos engineering group connected with the HGI situation. While Lou was in the program only 5 or 6 years at Mishawaka he was there during the ignition delay problems and "HGI" fix. He also worked on Typhon until that effort stopped. The other men in the group of five were two from Field Engineering who coordinated things with the Navy and one from the manufacturing Quality Control section. These three men had been thoroughly briefed on the HGI retrofit procedure so we were a team. That was the five to go to the Galveston off the coast of Vietnam. So, a little more delay and Tokyo and some more site-seeing. Then one rainy day we got word the Navy was going to fly us to Manila. The five of us and our equipment went to some military field and met up with a Navy Lockheed Constellation plane. Navy personnel loaded our equipment on the plane and we were ready to go when some Navy man said you cannot go - you do not have visas to the Philippines. That stopped the show. The Navy man said they would fly our equipment on down to Manila anyway and store it there and we could get visas at our embassy in Tokyo and fly to Manila later and pick up our equipment. Our field engineering man said "no way" are we becoming separated from our equipment. Unload it now and store it here at the field and we will pick it up later. We did not make Navy friends at that moment. Anyway, from that moment on, we were on our own. We went to our embassy, got visas, wired Bendix for more money, bought tickets on a commercial airliner, got all of our equipment aboard and flew to Manila with a stop at Okinawa. At Manila we were met by a Navy van and we picked up our equipment and the Navy van drove us to Subic Bay where we met up with the USS Cimarron AO-22 oiler and then on to the USS Galveston. I've got to hand it to our field engineering man - he did all the untangling of the mess. The Navy did take care of us from Manila to the Galveston and back to Manila again. From there we were on our own again. We wired Bendix for more money and the five of us split up and found our way back to Mishawaka. Lou DeGrace and I stayed together and toured Manila and met old Filipino friends from WWII days when I was stationed in Manila. While the Bendix retro-fit group was first in Tokyo before splitting into two five man groups we did a lot of site-seeing and shopping. There was a bit of problem in getting things we bought mailed back home (for the five of us going on to Vietnam) as we felt we couldn't carry our personal purchases on with us to Vietnam and back. Except for me. My wife wanted a Japanese tea set and I bought one and carried it all the way. In the photo you see us walking off the plane at the Airport in Okinawa on the way to Manila. 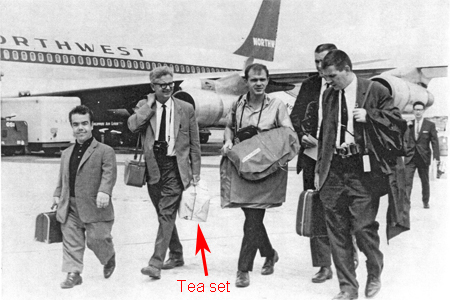 You will notice the light brown package in my left hand - containing a complete eight piece Japanese tea set. I carried them all the way to the Galveston and back home, including the two high line deals and everything involved for the rest of the trip. I got back home with the full set completely OK. Of course, as to be expected, my wife said, "Isn't there another color you could have found?" I told her there were a lot of memories in that color already. Anyway she did like it but never used it because I think she was afraid something might get broken. It's sitting right now in one of the cupboards - unused. During my short time aboard the USS Galveston in September, 1965, doing the HGI retrofit, I experienced high lining from the oiler, USS Cimarron, to the USS Galveston (at night). They put a blinking light on my life jacket shoulder and they explained that if they dropped me in the sea they might be able to find me. They knew a green horn when they saw one. Firing occurred (5" diameter I think) while we were there and it sounded like being inside a bass drum. I also saw a spotter plane fly by and waggle his wings. One time we made a high speed run up to Tonkin Gulf to rescue a downed pilot (we were told). 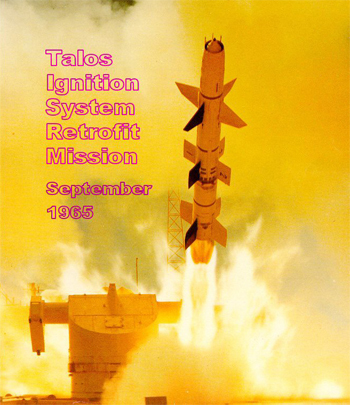 We were locked down in the area just forward of the blast doors opening to the Talos launchers where Talos missiles were rolled out and we did our retrofit. I do remember we were locked in there during the run to Tonkin Gulf and we wondered what we were to do if something happened. Anyway, as non-Navy guys we really enjoyed our time on the Galveston and on the Cimarron. While on the oiler, coming from and going back to Subic Bay, we did numerous UNREPS. Many were at night and we were told they liked night time better. I'll tell you, we were all impressed with the Navy. One thing I remember were the beautiful white beaches along the Vietnam Coast. We were quite close it seemed to me. Exactly where we were I don't know. DaNang and Yankee Station were mentioned. We did see the Vietnamese boats that tried, it seemed, to get in the way.